A list of lectures, talks and visits from the past few years. How commercial archaeology works - the frustrations, finding more than we bargained for and the brilliant moments of discovery. Outlining some of the interesting information about Tadcaster's inhabitants contained in the records. A lithograph of Tadcaster Mill published in 1868. Pages of 20th Century Tadcaster: a contemporary account of 20th century Tadcaster. Members may download a copy of the book here. Toulston Lodge (Tadcaster Grammar School). 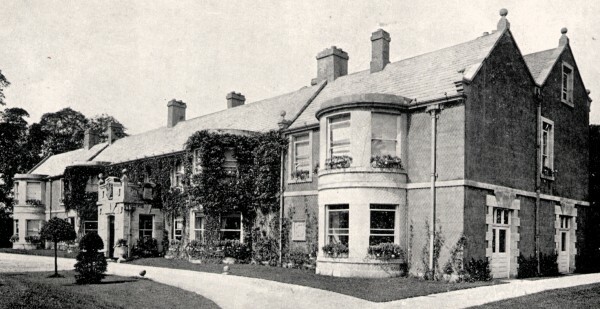 Toulston Lodge in the early 20th Century. 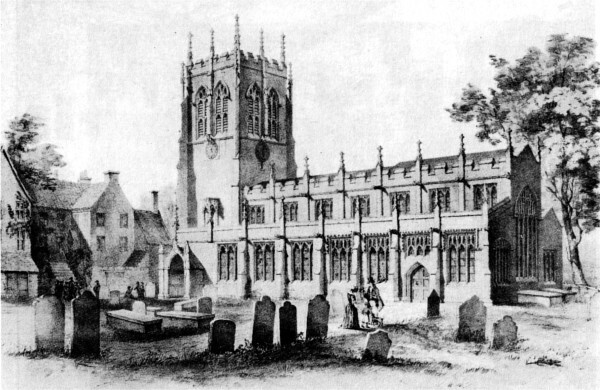 St Mary's Church, Tadcaster. Meet at 2pm. A conducted tour St Mary's church by various members of the society. St Mary's church has ancient origin, but the oldest parts are of the 14th and 15th centuries. The church was often flooded. In 1875 the church was carefully dismantled and over the next two years rebuilt with the floor 5 feet higher. Unfortunately this did not prevent the church being flooded in 2015. The entry in the Corpus of Romanesque Sculpture"
St Mary's Tadcaster in the 19th century. All Saints Church, Saxton. Meet at 7-30 pm. A talk and conducted tour of this 12th century church by Peter Jesty. The church is famous for the grave of Lord Dacre, killed at the battle of Towton and buried with his horse. There is a comprehensive entry for the church in the Corpus of Romanesque Sculpture"
A medieval cross on the wall of the church tower. Vindolanda was a Roman auxiliary fort (castrum) just south of Hadrian's Wall in northern England. Archaeological excavations of the site show it was under Roman occupation from roughly 85 AD to 370 AD. In recent years the discovery of well-preserved writing tablets has provided a unique insight into the lives of the fort's inhabitants. Moving heavy loads through the ages. The talk will be followed by a video of the last train from Church Fenton to Tadcaster. 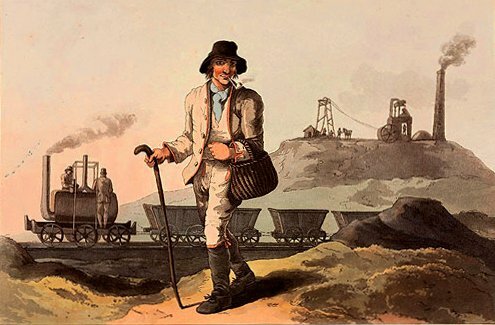 A view of the Middleton Railway in 1814, the engine moving coal from the colliery to a wharf on the River Aire. The first commercial use of a steam engine, constructed in Leeds by Fenton, Murray and Wood. David Wood was once the blacksmith in Bolton Percy. Marking 250 years since the death of author Laurence Sterne. Laurence Sterne (24 November 1713 -- 18 March 1768) was an Irish novelist and an Anglican clergyman. He wrote the novels The Life and Opinions of Tristram Shandy, Gentleman and A Sentimental Journey Through France and Italy, and also published many sermons, wrote memoirs, and was involved in local politics. More on Laurence Sterne and Shandy Hall. Background information for Tadcaster Workhouses. A memoir on a child's life in the Workhouse by Charles Shaw. "What has it got in its pocketses"
The medieval world explored by an archer's kitbag. English Heritage information about the castle. Annual General Meeting : followed by an update on the Riverside Archaeological Project, a Quiz and Refreshments. A tour of the Towton Battle Field. A conducted tour of Bolton Percy Church. Including special Christmas refreshments ! Annual General Meeting : followed by a quiz and refreshments. Community Archaeology Project in Tadcaster : Peter Murphy and Brian Elsey who will talk about the archaeology of North Duffield and its relevance to the Motte and Bailey project in Tadcaster. A Tour of Roman Aldborough : The tour will be conducted by a member of the Friends of Roman Aldborough; tea and cakes to follow. Further details to be provided at the meeting on May 22nd. The Evidence of Bones : a talk by Lesley Lambert, a member of the Richard III Society. An afternoon visit to Markenfield Hall : meet at the hall at 1-45pm, tour begins 2pm, cost £5. Details will be available at the meeting on May 23rd. Unless otherwise stated in the text, the content of this web-site is licensed under a Creative Commons Attribution-ShareAlike 3.0 Unported License.